What Is The Va Form 21-0781 Series? 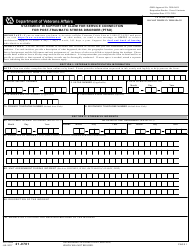 VA Form 21-0781, Statement in Support of Claim for Service Connection for PTSD is an application form that should be filled out by every veteran filing a claim for service-related PTSD. The form is submitted to the Department of Veterans Affairs (VA) explaining and describing the traumatic circumstances surrounding an in-service incident that has lead to the current condition. 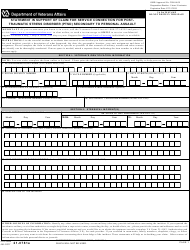 VA Form 21-0781a, Statement in Support of Claim for Service Connection for Post-Traumatic Stress Disorder (PTSD) Secondary to Personal Assault is a similar form used by veterans whose diagnosis was determined to have been caused by a personal assault. Both forms will ask the applicant to describe the event or events that caused the current condition along with the exact dates, time frames, and locations of the incident. Additional requested information includes your unit assignment and the dates of assignment along with the names and other details about the participants of the event. Feeling constantly on edge, expecting an attack, uneasiness. A medical opinion from a VA psychologist or psychiatrist or of the same specialist that is under contract with the VA.